Klik! StylerLib.Net for Windows Forms, part of Klik! Windows Forms Library, is a set of components to visually enhance your screens to create applications with next generation of look and feel easily. It's plug'n'play architecture allows you to use in new screens as well as already designed screens with minimal change and reqiures no code to work. You can style both built-in .Net controls as well as your favourite 3rd party controls easily. Klik! StylerLib.Net has a plug'n'play architecture which ties smoothly with your screens and allows you to enhance them visually with it's rich feature set. - A single component, when dropped onto a form/usercontrol, enhances the look of the controls in your screen without the need of single line of extra code or change. - Provides 3 different types of visual enhancement as Entry, Panel and Mirror where each is specially tailored for different types of control. - Rich visual features including captions for your entry controls, header/footer parts for your container controls as well as mirror effect for your button and picturebox controls. - Each type provides rich styling features such as gradientdrawings, images with effects such as mirror, border types which supports rounded corners, different look for different states such as hover, focus, etc. - Top notch design-time features where each of your control gets it's own STLStyler extended properties which you can use to adjust the look for your controls. Automatic verbs added to your control's designer for one click enabling/disabling styling, loading/saving and editing the style specific for that control. - Built-in professional predefined styles which eliminates the need to create your own and ability to apply them with a single click on design-time. Klik! StylerLib.Net is all about the look and it provides a rich set of styling options. For your entry control, you can specify a caption which does not eliminate the need for an extra label control but also adds gradientbackground, rounded corners, text with effects such as dropshadow and glow, extra images, etc. For your panel controls or list controls such as ListBox and DataGridView, you can use Panel type to add header and footer parts to your control as well as can draw their background with advanced gradient effects and images. Mirror type allows you to add a mirror effect to the look of your control which looks great on button and picturebox controls. A number of provided professional looking predefined styles allows you to style your contols easily with the look of Office2007, Office2003 and other custom looks. 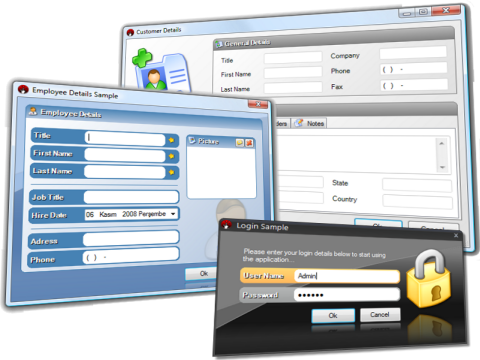 The common component provided with the library, KFormManager, allows you to skin your forms with Office 2007, Office 2003 and custom styles. 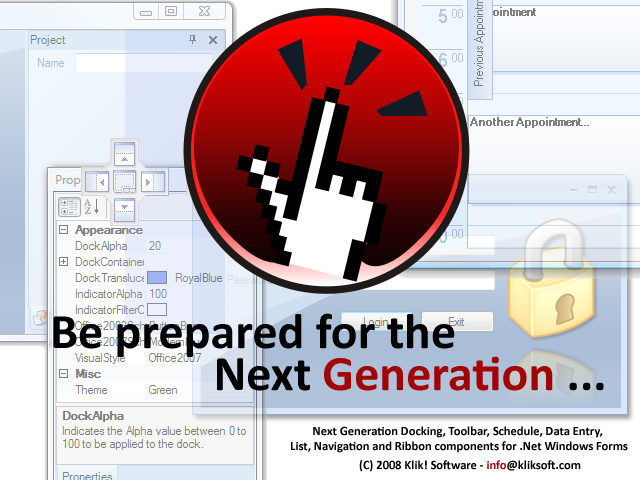 It can't be much easier to create a modern an appealing application with Klik! StylerLib.Net. As a core share with other Klik! Windows Forms Library components, each component has it's own quick access menu associated with it which allows you to do many things with a single click such as applying styles, getting help, etc. The controls you are styling benefits similar enhancements as well and are enhanced with design-time verbs to easily enable/disable styling, choosing predefines styles as well as load/save and edit of styles. Klik! StylerLib.Net is offered in 2 dlls which each targets different .Net framework versions as v2.0 and v3.X. The best way to see what our products does is to download and evaluate a trial version. Please click here to get the trial version of Klik! StylerLib.Net v1.0 for Windows Forms. A Murphy rule says that no application can be bugfree! :) Please click here to get the latest update pack for Klik! StylerLib.Net v1.0 for Windows Forms.